Agatha Christie's novel Peril at End House, published in the UK in 1932, became the first feature-length episode of the series, as well as the first episode of the second series (In fact, the episode has frequently been split into two, because the running time amounts to about 2x50 min). The story was adapted for television by Clive Exton and the director was Renny Rye. The adaptation really stays remarkably close to its source material, especially considering the fact that this is not just a short story but a full-length novel. Exton makes only minor changes. First, all references to Hastings's Argentinean farm, Poirot's retirement (and declining fame) and Poirot's investigation on the Blue Train have obviously been removed, since these events still hadn't occurred in the television series. Second, Miss Lemon is added to the investigation (she investigates the doctor in Harley Street and very sensibly takes Hastings's place in the seance), and Japp's role is somewhat expanded (he is present in the novel, but here he becomes the investigating officer, replacing Colonel Weston. Also, Hastings gets to visit Seton's solicitor in London on his own. Third, certain plot elements are dropped, like the red herring of Lazarus's offer for Nick's painting, Poirot's A-J list of suspects, Maggie Buckley's letter to her parents and the face (later revealed to belong to Freddie's husband) outside the hotel window. Neither of these clues are essential to the plot (or the reveal), so it makes sense to remove them - probably because of time constraints. Finally, Hastings and Miss Lemon are not told that Nick is still alive (which makes sense - not just because the viewer would be just as shocked as the suspects that she is - but also because Hastings would never be able to keep a secret, as Poirot has pointed out more than once). All in all, this is a wonderfully crafted adaptation that manages to stay true to the source material, and possibly even improving on it in certain places. Renny Rye makes excellent use of the location - there's an added opening scene with a plane approaching the coast (a nice way to include the novel's opening remarks by Hastings on how beautiful the Cornish coast is). The production design in this episode is also great, with a exquisite "Majestic Hotel" set and some beautiful seaside locations. The episode was shot in Salcombe, South Devon, and Salcombe Yacht Club doubled as the nursing home (see link). Moult House, near South Sands, in South Devon, became "End House", and the end scene was shot at the beach. Finally, Kingswear Railway Station became "St. Looe Train Station" (see link). The soundtrack to the episode is mostly appropriate, but it has sadly not been released. (The score was composed by Fiachra Trench, who stepped in through most of Series Two as Gunning was unavailable). In terms of character development, Hastings gets to display his love of cars and golf once more. Poirot smokes his Russian cigarettes again, we get to know about the necessity of eggs of exactly the same size (referred to in the novel in a conversation with Nick Buckley), and he gets to sit in his room and think. Miss Lemon gets to use her detective skills again - and we see a hint of her interest in the occult (even if it's imposed on her by Poirot). There are so many great performances in such a long film, but obviously, Polly Walker (Nick Buckley) is the one that really stands out. The contrast between the charming girl we encounter in the beginning of the episode and the angry and downright evil woman we see in the end scenes is very well done! I think adding Miss Lemon was a good idea...if only because it works much better use to her as the "medium" than to use Hastings! And it's always a delight to see her tenderness towards Poirot when he's upset. Though, really, Poirot should have let her know his plan before spring the seance on her! 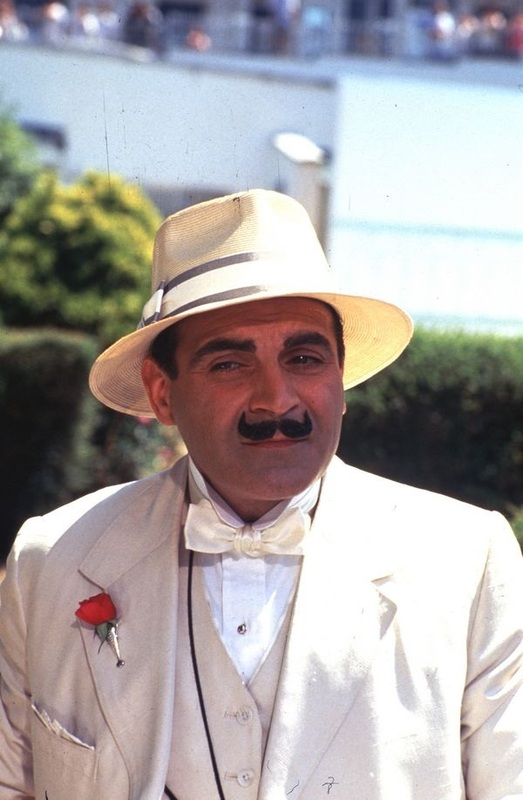 And I hope she hadn't been expecting to have a vacation because Poirot was on vacation. Now, am I crazy, or was something edited out of the DVD? Where Poirot asks Freddie if she thinks Nick might have become jealous of her, and Freddie's line about living an "insincere life"? I swear I watched the episode once (probably on PBS) and that was in there, but it's not on the DVD I just watched. 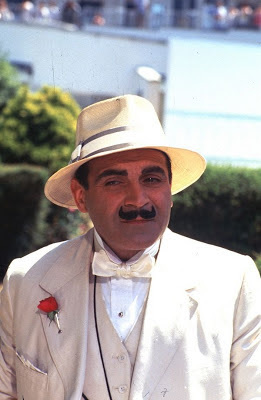 For once Poirot only exposes the criminals and doesn't wash everyone's dirty laundry in public. Although he still makes it theatrical. I have watched this several times and am unable to understand a lot of it. For instance, how did Nick's hat get a hole in it? Who fired the shot, and how? Nobody wants to kill Nick, who is herself the villain, and I cannot see how, in the peaceful setting on the terrace, anyone could have not been noticed trying to assassinate her. Nick presumably made the hole herself before approaching Poirot. No-one fired any shot, so there was no-one to be noticed. It was all a carefully planned set-up, in order to involve Poirot and give her story more credence. However, a plot hole I will share, is that the bullet would have been hot had nick not chucked the bullet down herself. That's a great question. It bothers me, too. If Nick already had the hole in her hat, did she throw down a bullet? Did she already know enough about Poirot to want to involve him? Did the Crofts shoot at her? Nope - Seaton wasn't confirmed dead yet. What about the fact that POIROT insisted that Maggie Buckley be called to End House in the first place? Yes I have been wondering this EXACT thing, and a lot of searching on the internet., including student comprehension guides hasnt revealed an answer. To be more detailed - Maggie Buckley was invited only after Poirot suggested to Nick that a trusted friend/relative should be called. In other words, how was Nick to know that Poirot would suggest such a thing in the first place? Not omitting the fact that her bumping into Poirot in the first place was itself, serendipitous, since presumably, she had no idea of Poirot's sojourn. It's a while since I've seen or read this, but doesn't Poirot just suggest getting someone, and Nick chooses Maggie? Either that or Nick tells him about Maggie, thus seeding the idea in his head? Either way, I think the point is she manipulates him into advising her to bring Maggie down. That's true, Stufarq. When she was talking to Poirot, she presented Charles and Maggie as her only living relatives - with Charles being sufficiently unsympathetic to make Maggie the only option as a companion. But Japp later remarks that Maggie's *parents* have travelled down from Yorkshire! So Nick was lying, or being misleading - a definite red flag about her credibility, in my opinion. I really liked this episode and, having watched it again recently, I think the changes made in the adaptation make sense - I think it's also clear that Nick planned to plant the evidence of the faked attempt to shoot her at the hotel and she wanted a by-stander, other than her friends, to give credibility to the threat on her life. I don't believe that - as in other episodes - the "bad" characters deliberately choose Poirot as the witness to their schemes, he just happens to be there and get tangled in the situations. I'd say in this case, Nick just wants an external element to whom she can present the series of "accidents" and plant the idea of someone wanting to hurt her. In fact, one can argue that Poirot being a detective only makes her life more difficult, although she successfully manipulates him (as she would expect with someone else) to tell her to find a protecting friend to come and stay with her. Speaking about locations, I wonder if the interiors of End House are The Mouth interiors - at least given recent pictures I saw of it. Does anyone know if the interiors were shot there, or somewhere else? Very Beautiful Polly Walker! Ces't Magnifique! So who was her accomplice? The bullet that went through her hat, who shot?